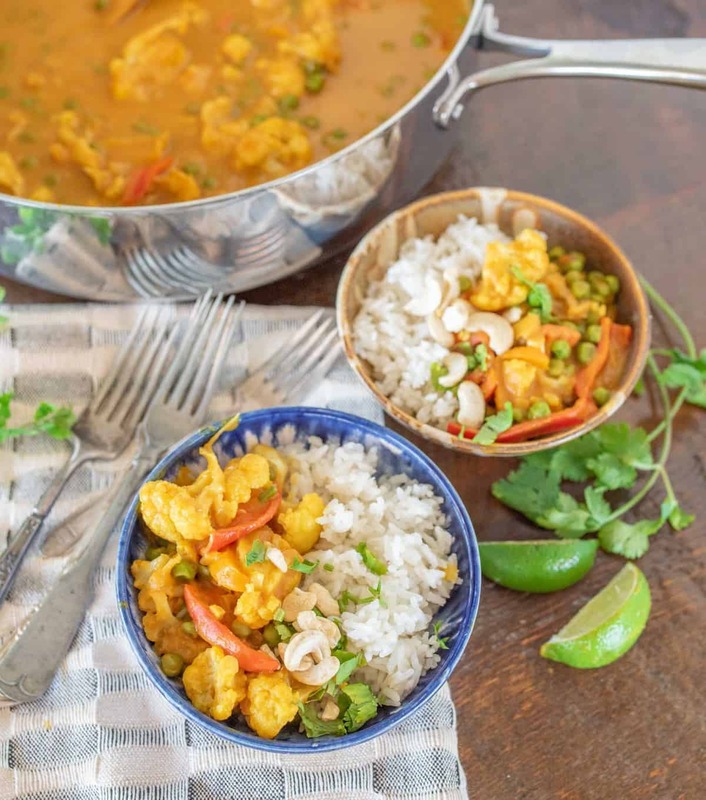 Quick and easy pumpkin cauliflower curry recipe made with canned pumpkin, coconut milk, curry paste, and lots of vegetables for one healthy, filling meatless meal. Few things are more delicious than really good curry. Truth be told, I never had anything like this until well after I was married and a friend (Hi Rivka!) made me my first taste of Thai green curry for my birthday. I’ve been a curry and Thai food fan ever since and have made the point to try lots and lots of different dishes. Sometimes all it takes is one friend introducing you to something new to get you hooked. I think having a friend bridge the gap to something new is such a gift. If curry is new to you, I’ll be the friend you can trust for the introduction. I haven’t led you astray yet! 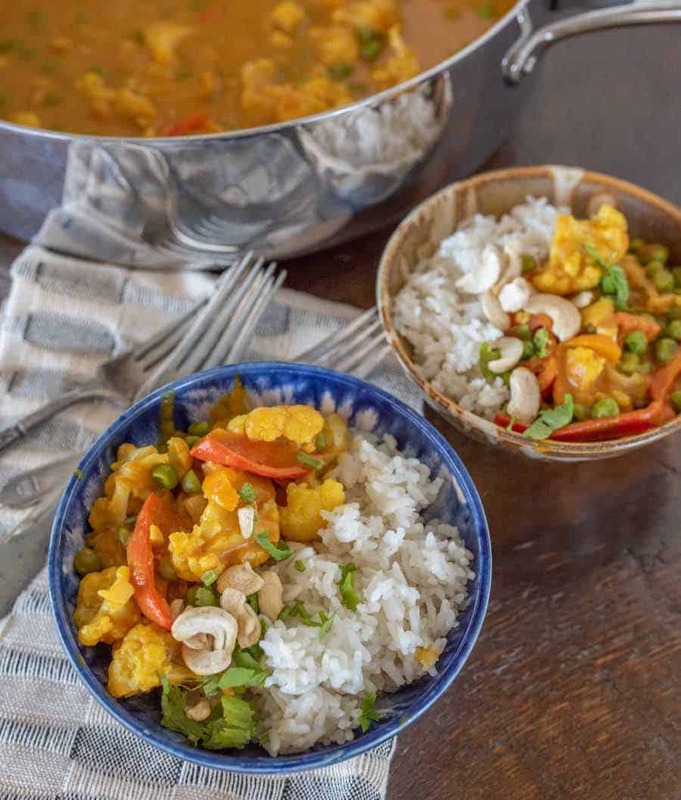 This pumpkin cauliflower curry is creamy, beautiful, packed with veggies, and so simple to make. You have lots of flexibility when it comes to the veggies you use, too, so make it what you like, using what you have on hand. The pumpkin is very subtle in this dish; I don’t think you’d be able to identify it if you didn’t know it was in there. But it adds a great creaminess, sweetness, and bright color that really makes this dish fun to eat. This is a recipe that I make over and over again, and I can’t wait for you to love it as much as we do. This pumpkin recipe is part of pumpkin week! A week that I dedicate on the blog to all things pumpkin, sweet and savory alike. I’ve done this every year for a few years now, and I enjoy it so much. I hope it inspires you to get in the kitchen and gives you a few more ideas on how to use pumpkin besides the classic pumpkin cookies. 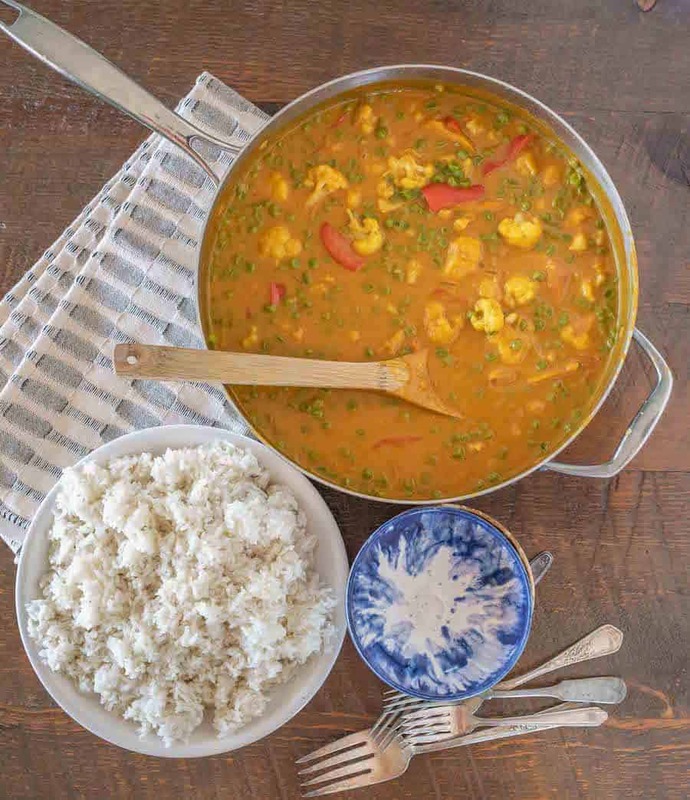 The thickness and creaminess of your curry is going to depend on your coconut milk. Full fat coconut milk is going to lead to creamier and thicker curry than using light coconut milk would. You can also sub chicken or veggie broth for one can of coconut milk to make a thinner curry. If your curry is too thick, you can add a small amount of chicken or veggie broth to reach the desired thickness. The amount of curry paste that you add will determine the heat of the dish. If you don’t like things hot, add just 1 tablespoon (or less). If you like medium, try 1-2 tablespoons. If you like a hot curry try adding 3 tablespoons. The heat level is also going to depend on the type and brand of curry paste. We love Mai Poi brand green curry paste (I actually have 4 different curry pastes from this brand, love them all). I like to use 1-2 tablespoons of it for a nice medium curry. It’s warm but not so hot that my kids won’t eat it (they don’t mind a little heat but they don’t want it super spicy). If you get to cooking, give it a taste, and find out you have a gotten things too spicy, you can add additional coconut milk to dilute the curry paste a bit. On the opposite end, if it’s not enough spice or flavor, feel free to add more curry paste towards the end of cooking time. This recipe is very flexible. You can add what veggies you like and you can also add whatever cooked protein such as chicken or shrimp that you might like. Make it your own! 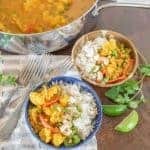 Quick & easy pumpkin cauliflower curry recipe made with canned pumpkin, coconut milk, curry paste & lots of vegetables for a healthy vegetarian dinner. In a large saute pan or cast iron skillet, heat the oil and curry over medium to medium-high heat, stirring to combine it well. Let it cook until it starts to smell very fragrant and is well combined, about 2 minutes. Add the ginger and garlic and cook until fragrant, about 30 seconds. Pour in the coconut milk and add the pumpkin puree. Stir to combine. Add the cauliflower pieces. Bring the mixture to a simmer and let it cook, stirring often, for 10-15 minutes or until the cauliflower is tender but not mushy. Stir in the bell pepper, peas, soy sauce, turmeric powder, and sugar. Simmer for an additional 5 to 10 minutes until the veggies are tender (but not overcooked) and everything is well combined. Serve the curry over hot cooked rice with a dash of fish sauce, a sprinkle of chopped cilantro, and a squeeze of fresh lime on the top. Don’t skip these – they are a must for finishing off the dish. More soy sauce to taste can be substituted for the fish sauce. You can also add a few tablespoons of cashews to the top before eating. 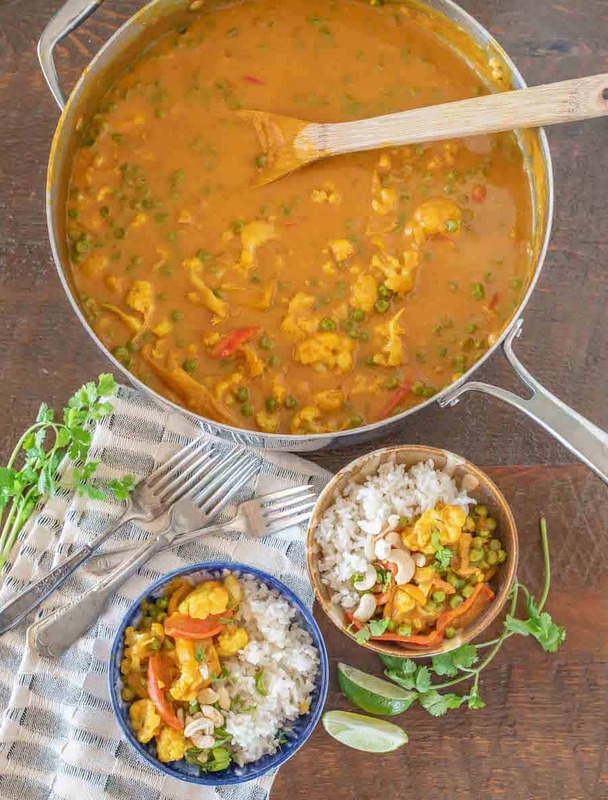 The thickness and creaminess of your curry is going to depend on your coconut milk. Full fat coconut milk is going to lead to creamier and thicker curry than using light coconut milk. You can also sub chicken or veggie broth for one can of coconut milk to make a thinner curry. The amount of curry paste that you add will determine the heat of the dish. If you don’t like things hot, add just 1 tablespoon (or less). If you like medium, try 1-2 tablespoons. If you like a hot curry try adding 3 tablespoons. The heat level is also going to depend on the type and brand of curry paste. We love Mai Poi brand green curry paste. I like to use 1-2 tablespoons of it for a nice medium curry. It’s warm but not so hot that my kids won’t eat it (they don’t mind a little heat but they don’t want it super spicy). If you get to cooking, give it a taste, and find out you have a gotten things too spicy, you can add additional coconut milk to dilute the curry paste a bit. So much curry and pumpkin goodness to go around. 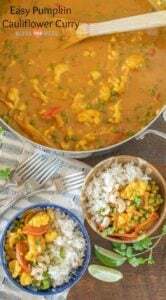 If you are new to curry, this recipe is a nice safe place to start. Enjoy this recipe from my kitchen to yours and thank you for being here, friends. Delicious! 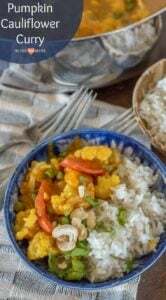 I wanted to make a curry using coconut milk and canned pumpkins, which I had on hand. This recipe is simple and quick, and has a full, complex flavor. I’ve tried to create one out of thin air, and it was bland. I didn’t have cauliflower in the fridge, but did have zucchini and carrots, so I used those with some chicken. We agreed it is a winner. Thank you! And thank you for coming back to leave the stars (they really help a good recipe shine and google definitely recognizes the importance too, I appreciate that!). Those veggies sound delicious in the curry. So glad you liked it as much as I do! Oops, forgot the stars. Thanks!